Everyone knows a job is much easier with the right tools. Right? It’s no different with immigration. In immigration court cases, sometimes the biggest hurdles can be cleared by figuring out the right tools to solve the problem. In almost every case an early “problem” is the lack of information or documents to tell your immigration story. For example, you may have filed immigration forms 5 or 10 years ago but no longer have a copy of them. We can often solve that problem by gaining access to the documents already in the immigrant’s government file. However, the government doesn’t make that easy. If you want to see your file, you can’t (usually) just go to the immigration office and ask to see it. One method of tracking down those documents and key facts is by using the Freedom of Information Act or FOIA to request both the documents in your file as well as government documents that might affect your case. If you navigate the FOIA system correctly (and this is one area where having an immigration attorney for immigration court can make a difference), you can open the door to a world of possibilities. At a minimum, the government will send you many of the documents or electronic information related to you, even documents you didn’t know existed. The Freedom of Information Act (FOIA) is a federal statute requiring disclosure of information and documents controlled by the federal government. It lists what documents are subject to disclosure, describes the mandatory disclosure procedures and grants nine exemptions to disclosure. If you have an immigration case, a FOIA request might be the only way you can get, these documents. So, how do you,do that? Every agency has its own mechanism for making a FOIA request, so you need to star by asking yourself who has the documents you want. Making a FOIA request to the DHS is easy. You can make your request by email, fax, or by sending it in the mail. There is a form, but it isn’t required. You can even submit your request online, for free. Requesting your file from any component of the DHS is as easy as making your request, specifying what documents you want, and waiting. The immigration courts and the BIA, which are part of the Department of Justice, make it even easier. You can email a request to their email address and in about a month you receive the court’s file, scanned to a CD. They are much faster than th DHS. We often submit a FOIA request for the court’s file to make sure we received everything the government filed and to make sure we got the judge’s decision. Or in cases when a new client wants us to reopen his old case from 15 years ago, the only way we can figure out what happened is to file a FOIA request. Nor is FOIA limited to paper documents. We have requested and received videos of client interviews with immigration, recordings of hearings, electronic information contained in databases, etc. If the government doesn’t respond in time, you can file an appeal. If they still don’t respond in time you can take them to federal court. 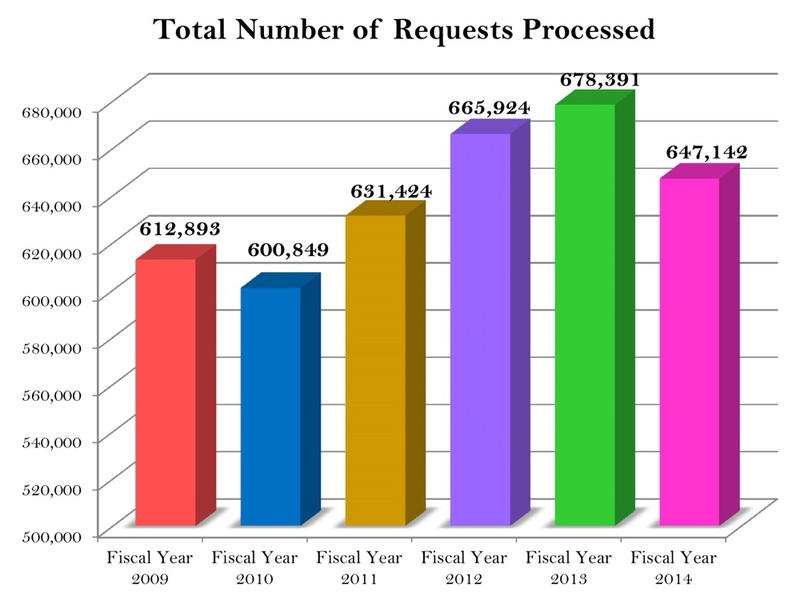 The increase in requests is a problem, but the government has also slowed down on processing them. 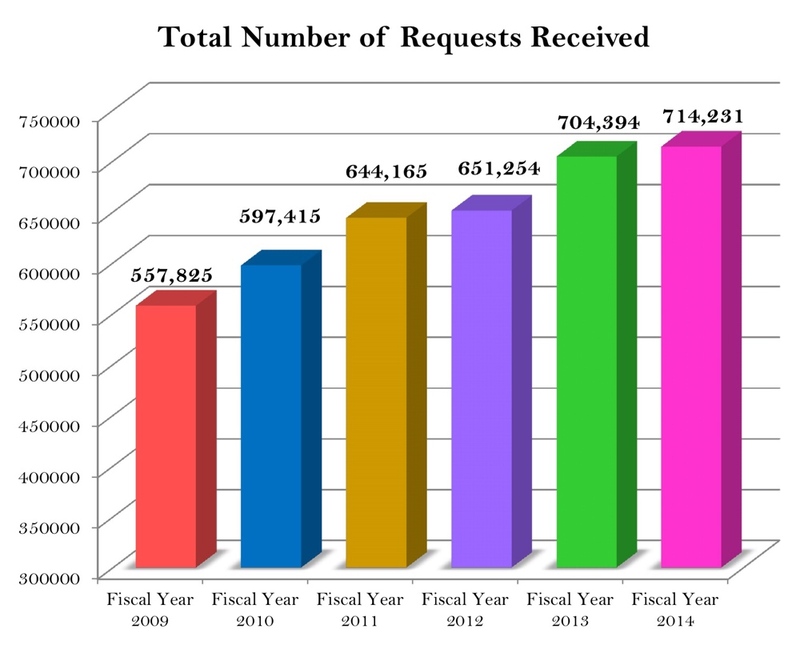 It processed less requests in 2014 than in the two previous years, even though requests keep going up. This combination has been terrible for the FOIA process. 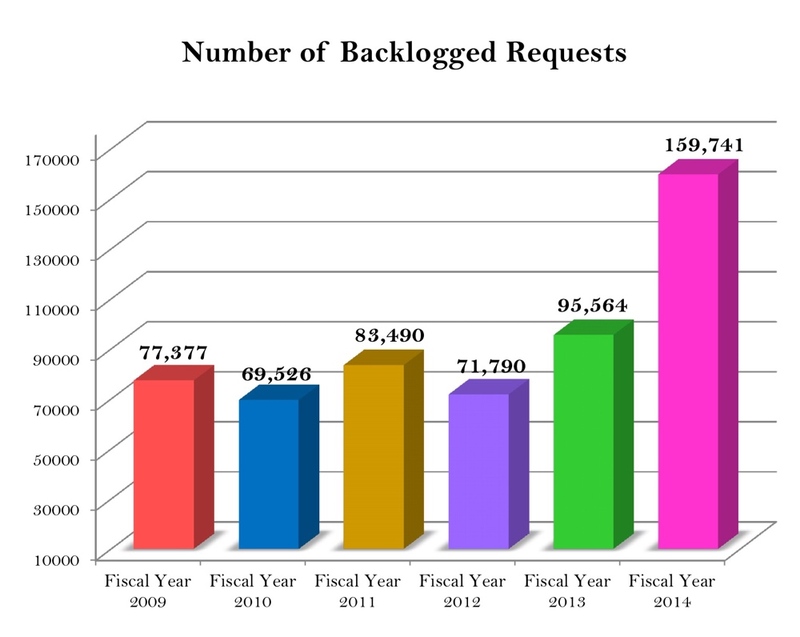 Increased requests and decreased processing has significantly increased the backlog for FOIA requests, which almost doubled last year. In addition to the FOIA, most states have an open records statute. If documents related to your case are in the hands of the state or local government, consider a local open records request. I have done this when my clients have alleged mistreatment while being held in immigration custody in a county jail. In a case last year, I was able to get video showing ICE agents attacking my client by asking for the video from the County, not from ICE. If you’re in immigration court, you can also submit a request to physically review your file and to listen to past audio recordings of your hearings. Sometimes the court clerk will even make you a CD (if you ask nicely). If they won’t, submit a FOIA request for the recordings. Although FOIA processing is sometimes slow, it doesn’t mean you shouldn’t ask for your file. A FOIA request can lead to documents you didn’t know were in your file (two examples of these that I’ve received: (1) an adjudicator’s hand-written notes on the application which we would have never known about, and (2) internal guidance documents telling the officers what to do with the case). If you filed documents and didn’t keep copies, you can get copies through a FOIA request. If you want the government’s notes or preparation materials, sometimes those are sent too (although there is a list of exemptions in the statute, and not all documents will be provided if an exemption applies). The point is that you can and should use these tools to prepare yourself to win your immigration case.